If all hippies were like Willie Nelson, I wouldn't have to deep six the state of California when I become president. What I mean is that your average hippie places himself on a pedestal of self righteousness and does nothing to further the inane causes that his over active sense of guilt forces him to believe in. That brings us to Willie, who is not a traditional hippie. All Willie Nelson does is support and work for causes he believes in, Farm Aid anyone. Well Willie is at it again, this time with a great technology called bio-diesel. 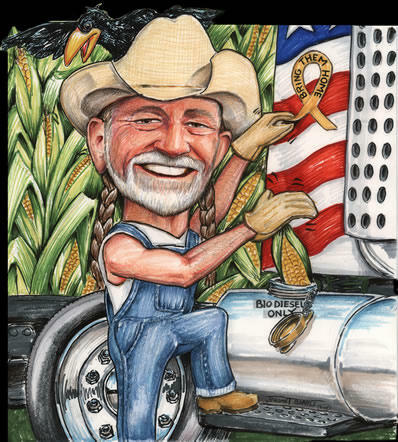 Willie Nelson has lent his name and likeness to Bio Willie Diesel a commercial bio-diesel product available to the public. Basically bio-diesel is vegetable oil mixed with some chemicals to break down the natural viscosity and thus rendering it useful as a fuel. costs less and gives better mileage! is grown by American Family Farmers! is biodegradable and has low toxicity! For this reason and for just being a general kickass guy, I present the "Best Texan Since William B. Travis" award to Willie Nelson. New race found living six inches under Denver, all named Mort or Mortonson. Golf to be Olympic sport in 2012 at exspense of Baseball. The stray cats that my neighbor feeds might meet with an unfortunate antifreeze related accident in the near future. To be unsuccessful in retaining possession of; mislay: He's always losing his car keys. To be deprived of (something one has had): lost her art collection in the fire; lost her job. To be left alone or desolate because of the death of: lost his wife. To be unable to keep alive: a doctor who has lost very few patients. To be unable to keep control or allegiance of: lost his temper at the meeting; is losing supporters by changing his mind. To fail to win; fail in: lost the game; lost the court case. To fail to use or take advantage of: Don't lose a chance to improve your position. To fail to hear, see, or understand: We lost the plane in the fog. I lost her when she started speaking about thermodynamics. To let (oneself) become unable to find the way. To remove (oneself), as from everyday reality into a fantasy world. To rid oneself of: lost five pounds. To consume aimlessly; waste: lost a week in idle occupations. To wander from or become ignorant of: lose one's way. To elude or outdistance: lost their pursuers. To be outdistanced by: chased the thieves but lost them. To become slow by (a specified amount of time). Used of a timepiece. To cause or result in the loss of: Failure to reply to the advertisement lost her the job. To cause to be destroyed. Usually used in the passive: Both planes were lost in the crash. To cause to be damned. To operate or run slow. Used of a timepiece. To lose control; blow up. To become deranged or mentally disturbed. To become less capable or proficient; decline. To operate too slowly. Used of a timepiece. Not fastened, restrained, or contained: loose bricks. Not taut, fixed, or rigid: a loose anchor line; a loose chair leg. Free from confinement or imprisonment; unfettered: criminals loose in the neighborhood; dogs that are loose on the streets. Not tight-fitting or tightly fitted: loose shoes. Not bound, bundled, stapled, or gathered together: loose papers. Not compact or dense in arrangement or structure: loose gravel. Lacking a sense of restraint or responsibility; idle: loose talk. Not formal; relaxed: a loose atmosphere at the club. Lacking conventional moral restraint in sexual behavior. Not literal or exact: a loose translation. Characterized by a free movement of fluids in the body: a loose cough; loose bowels. To let loose; release: loosed the dogs. To make loose; undo: loosed his belt. To cast loose; detach: hikers loosing their packs at camp. To let fly; discharge: loosed an arrow. To release pressure or obligation from; absolve: loosed her from the responsibility. To make less strict; relax: a leader's strong authority that was loosed by easy times. To discharge a missile; fire. Acting in an uninhibited fashion. I just read a fairly asinine forum post by some jackass trying to validate his nerdy existence by boasting about the size of his buddylist. I choose to go the other way, I choose to validate my nerdy existence by treating my buddylist like the most exclusive club on the internet. Not even my parents are on my buddylist, of course they don't have screen names, but that's beside the point. My buddylist comprises about .000000383% of the earth's population, in contrast the average AOL user's buddylist contains roughly 50% of the population. If you have received the great honor of being on my buddylist then you are beyond the mere riff-raff that loiter around other peoples' buddylists. 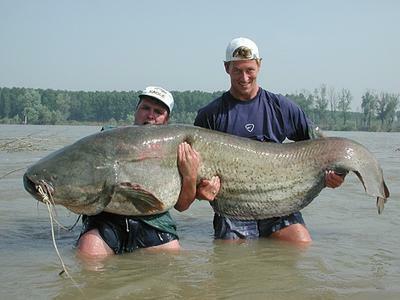 I wonder what the poor people are doing tonight; hold on I'll go and look out my window. I learned a new lesson today. If you ask a pet shop clerk which rabbit tastes best, they won't sell you any rabbits. Then you are stuck trying to shoot squirrels in the park with your blowgun. Like my dad always says, "squirrels are just rats with good p.r." Nobody wants to eat a rat, they're filthy animals. Not even a drug addict bum with a +2 crack habit of poverty would stoop so low as to eat a rat. If you are ever unfortunate enough to have to spend any time in Waco you will certainly meet some bums. Some people are uncertain as to how to deal with bums and/or are afraid of dirty poor people. To this end I have published the following guide to the bums of Waco. There are two basic groups of bums in Waco. Homeless bum: This bum is not to be feared for you will never see a homeless bum (in Waco) talking to anyone except others bums. The one exception is Sunday when naive young Baylor students give the bums doughnuts and coffee in a feeble attempt to "fix" the bums. Drug addict bum: These will compose the bulk of the bums you will meet. Drug addict bums are far and away the most annoying people ever. They lack any form of self respect and are willing to do anything for miniscule amounts of money. This type of bum is easily detected by their ludicrous stories about broken down cars that only need $5.00 dollars to be fixed. Never give anything to drug addict bum; getting involved with drug addict bum will only bring trouble. There are also some more advanced bums in Waco; another guide will be published shortly. I love baseball video games, from basesloaded to mlb 2k5, but today's games have so many gimmicks that it is nearly impossible to just play the games. The gimmicks that make the games unplayable are almost always batting gimmicks; I'm sure that they are there to make the experience more "real", but if I was able to hit a Roger Clemens fastball I wouldn't need to buy your games because I would be playing baseball professionally. The one thing I feel your games need is a batting practice mode; not only could this make it easier to learn the batting gimmicks that are inevitable, but it could also make the game more fun. There could be different scenarios in this mythical bp mode in which you have to accomplish a certain goal, i.e. hit 10 curve balls in a row or hit the bull over the right field bleachers and win a steak. In the end a batting practice mode would allow the player/customer to learn whatever crazy gimmicks yall have added into your latest games, and therefore make the replay value higher because no one likes striking out. If there were a race war between crawdads and shrimp, the shrimp would totally get their butts' kicked. I once stabbed a waiter with my fork when my etouffee had a shrimp in it. Crawdads should be in the crustacean hall of fame for being the most versatile ingredient in all of crustaceandom. When I die I want to be boiled and then have my brain matter sucked out of my head and eaten just like a crawdad.